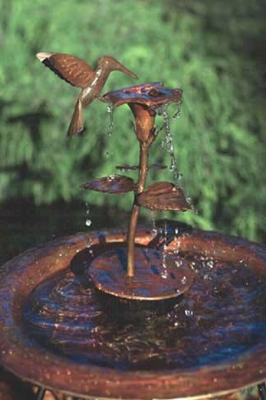 Hummingbird Copper Dripper/Fountain adds character to your garden, deck or patio area. Bird Bath a have to have accessory!!!! Electric Pump only. Depth of water in bath for the fountain to operate at its best is approximately 3 inches. The minimum height of the water level for the pump to continue to work is approximately 2 inches. The dimension height from the metal base plate to the bottom of the circulating pump is approximately 3 inches. There is not a safety shut off if the water should go down too far to function.